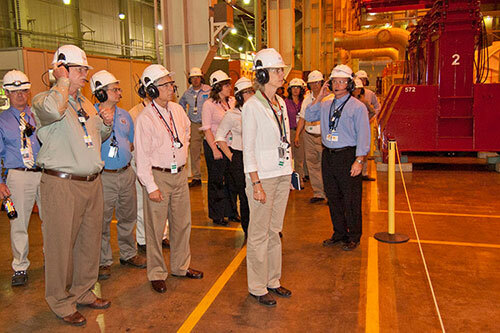 Nuclear Regulatory Commission Chair Allison Macfarlane (center) and U.S. Rep. Fred Upton (center – left) on a tour of D.C. Cook Nuclear Plant. That was the opening statement made by AEP Senior Vice President and Chief Nuclear Officer Larry Weber who had the unique opportunity to address both the Chair of the Nuclear Regulatory Commission, Allison Macfarlane, and local Congressman and chair of the House Energy and Commerce committee, Fred Upton. Those two national energy policy leaders came to D.C. Cook Nuclear Plant on June 6 to tour the plant with a focus on Fukushima upgrades including used fuel storage. The visit came after a tour of Entergy’s Palisades Nuclear Plant located 30 miles to the north earlier that morning. The tour included the Spent Fuel Pool in the plant’s Auxiliary Building, the Dry Cask Storage facility and viewing of a 500kw/600v diesel generator and diesel-powered 800 gallon per minute pump. These are just two of the many pieces of equipment that have been recently purchased to provide power and cooling water to the plant in the event of a large-scale emergency similar to the earthquake and tsunami in Japan. A new earthquake and tornado-proof storage facility is being built on the Cook site to store the equipment. Additional equipment will be kept in two secure locations away from the site, but close enough to be available within 24 to 48 hours. Processes, procedures and training are also being developed to use these new emergency response capabilities that go beyond the already redundant safety systems that exist. In addition to site specific actions, Cook is participating in the U.S. nuclear industry’s Fukushima response plans. There are three regional response centers that will supply large-scale emergency power and components to any nuclear plant in the United States within 24 to 48 hours. Plants are installing common connections and will have the capability to quickly install the equipment. The Spent Fuel Pool observation included a discussion of new level-monitoring instrumentation that is being installed this summer. At Fukushima, operators could not determine cooling water level in the pools and this contributed to problems mitigating the accident. Macfarlane and Upton held a press conference at the Cook Visitor Center following the tour and said that Cook and Palisades are operating safely and meeting regulatory expectations.